Viet Nam was placed at 10th position in the world for luring foreign workers, according to the HSBC Expat Explorer Economic league table. The bank surveyed over 5,000 respondents in four continents based on a number of factors such as earning levels, disposable income and ability to purchase luxury goods. The survey shows that as much as 50% of expats in Viet Nam agree that they can earn more since moving to the country. Two third of them (63%) think that the financial status of their household has been improved. Meanwhile, a third of them relate the country with higher salaries in comparison with other Asian counterparts. A third of expats found that they have better living opportunities than in their own countries. In terms of expat experience, Viet Nam falls into the fourth quartile of the Expat Experience league tables at 27th. A third (30%) expected a better quality of life but upon relocation, two in five (40%) actually found that to be the case. Almost three quarters (73%) have found that they have developed and been stretched as individuals, and nearly the same proportion (70%) expected to lead a more interesting life and associate the country with being a culturally interesting place (63%). Despite the difficulty of the local language with three quarters (70%) described learning it as difficult – expats in Viet Nam still make an effort to learn and use the language (70%). 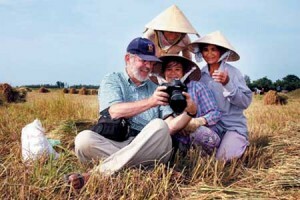 Nearly two thirds (63%) associate Viet Nam with friendly locals. Latest statistics published by the Ministry of Labor, Invalids and Social Affairs show that as of July, Viet Nam was home to 77,087 expats of whom 49,983 were granted working licenses. Expats in Viet Nam came from over 60 countries and territories. Around 58% of them come from Asia including China, Japan and the Republic of Korea; 28.5% other from the Europe including the UK and France. Male expats accounted for 89.9% of the total number. Expats over 30 years old made up 86%.